Save 10% on Your Entire Order with Coupon Code CANDY10! This basket has a length of about 8.5 in, a width of about 8.5 in and a height of about 2 in. A Personalized Greeting Card can be added during the checkout. This product is certified Kosher Dairy. Shop now and we'll ship your order when you want; simply note your preferred delivery date at the checkout. 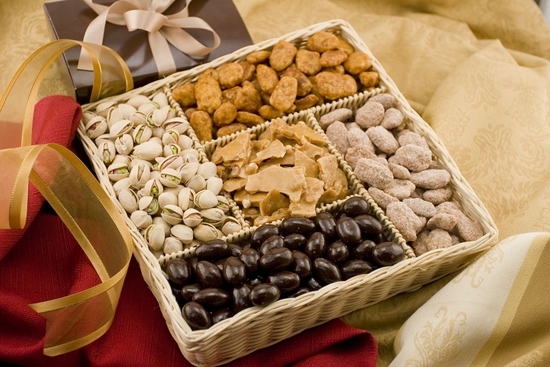 Pistachios, Peanuts, Pecans, Almonds, Chocolate (sugar, chocolate liquor, cocoa butter, soy lecithin(an emulsifier), vanillin), Brown Sugar, Confectioner's glaze, Gum Arabic, Butter, Salt, Soy Lecithin (an emulsifier), and Artificial Flavor. My parents loved this. The website was easy to use for me to ship it two states away. They said the basket was so pretty and the nuts were fantastic. We gave these as gifts to tenants and they told us they were wonderful and loved them! They were delivered in a timely manner and it was easy to navigate the website. It was a gift and I am told they enjoyed it very much! All Rights Reserved. Copyright © Candy Gallery, Inc.. This website material may not be copied, reproduced, published, broadcast, rewritten or distributed in any way. If there is any way we can improve your shopping experience, please contact us and let us know 800.269.7459. Every order comes with our 100% Satisfaction Guarantee. Copyright © Superiour Nut Company, Inc. All Rights Reserved.